We analyze IT Cosmetics beauty launches for the Spring season, including an epic foundation in 48 shades. Confidence in a bottle? That seems to be the promise of the new products created by QVC mogul beauty brand IT Cosmetics. 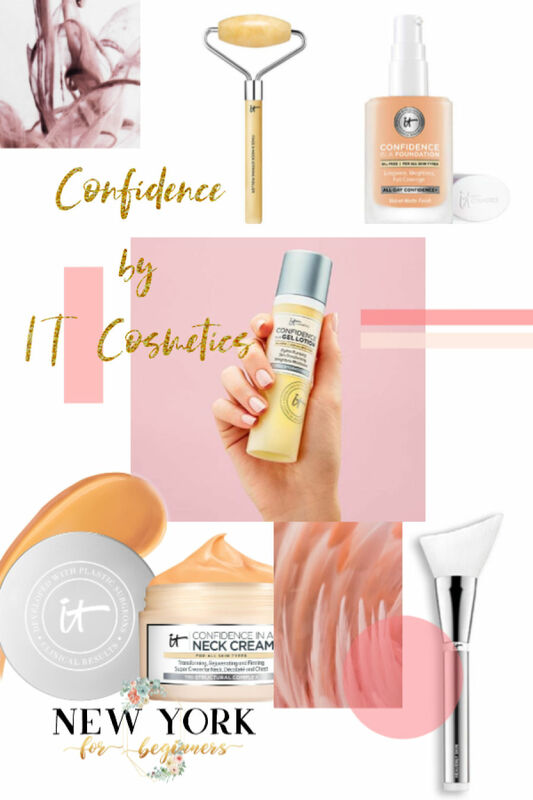 With four new references hitting the shelves in the Spring, IT Cosmetics is all about empowering women with clinically tested and problem-solving formulas. This launch got me all giddy with excitement, because I have a very particular undertone and not many brands have been able to nail it. 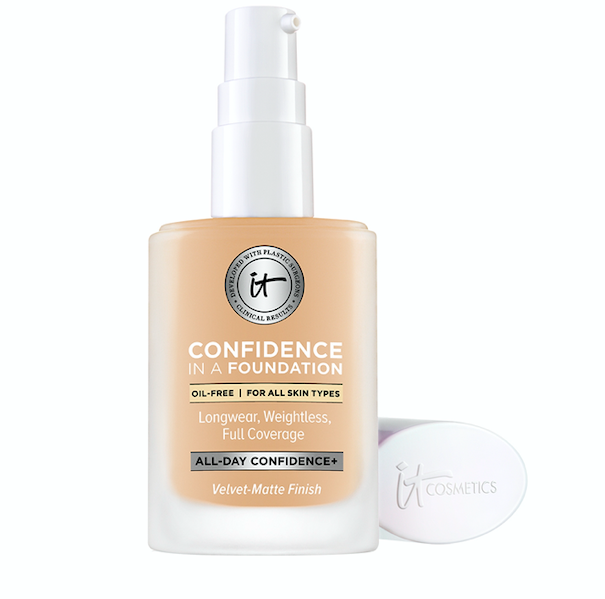 In a range of 48 shades, Confidence In a Foundation ($32.00) offers 24 hours of full coverage with a velvety finish and a boost of hydration. Carefully formulated with skin-loving ceramids, peptides, squalane and hyaluronic acid, it works extremelly well on my dry skin. Ladies, I’m calling it as it is: This stuff is legit. I have seen it cover acne marks, hyper pigmentation, dark eye circles and even rosacea with a brushstroke. 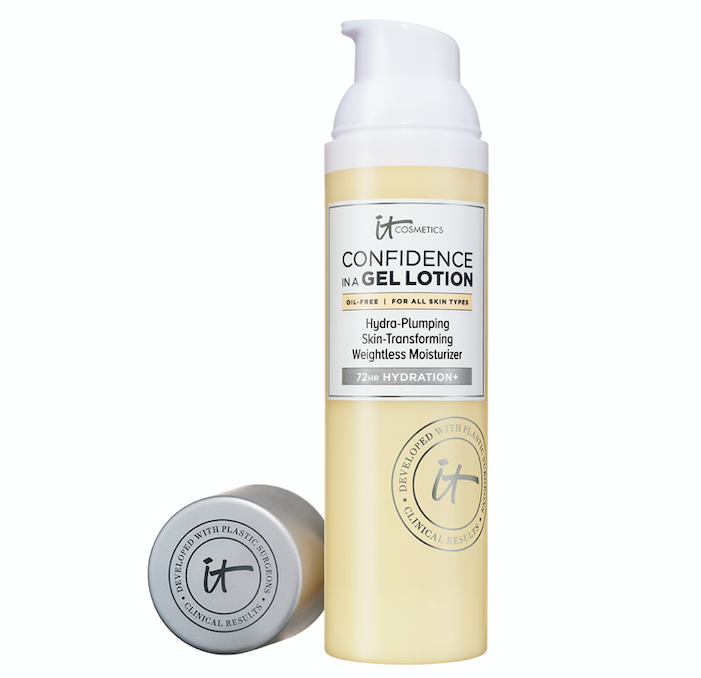 Created with dermatologists, it works well on sensitive skin and doesn’t break out combination skin. 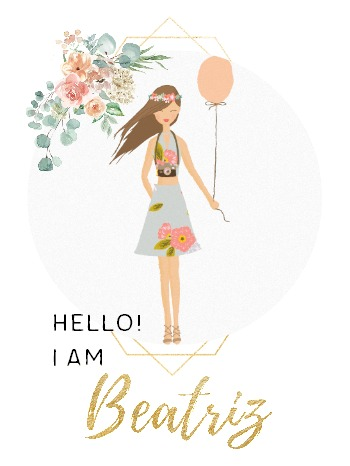 Still looking for something designed for combination skin? See our review of other IT Cosmetics foundation here. For best results, the new Foundation Brush No. 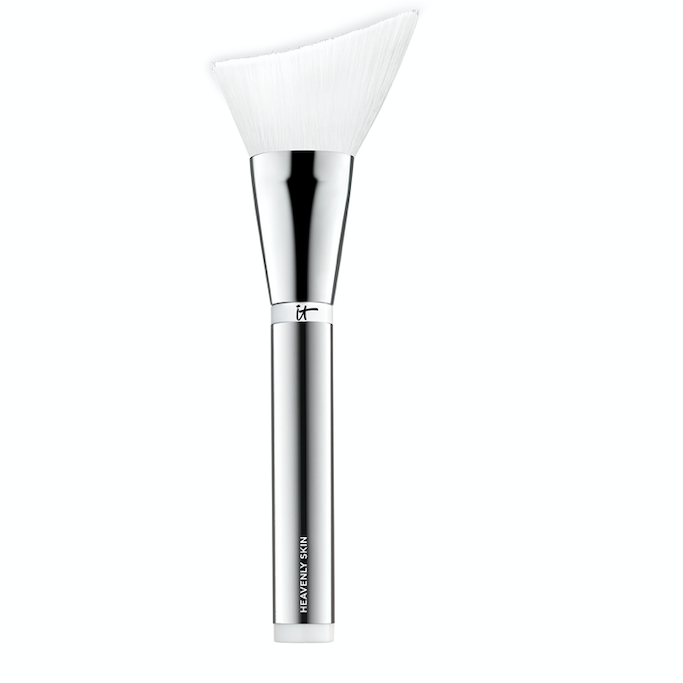 707 ($42.00) is perfect to achieve an even application and flawless finish. Made with the softest cruelty-free and vegan silky hair, it is infused with collagen, silk and peptides to hug every contour of your face. 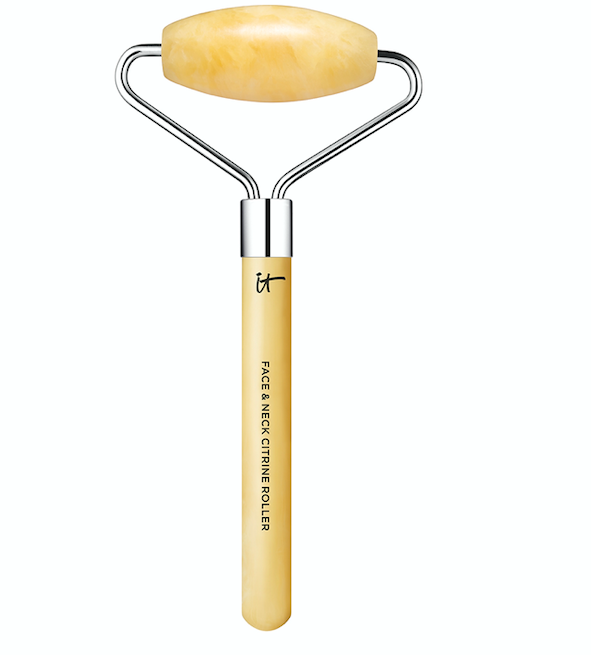 It works so well that I use it to cover my undereye circles and do my whole face in one sweep. Anyone else in here spends too much time looking at a smartphone? 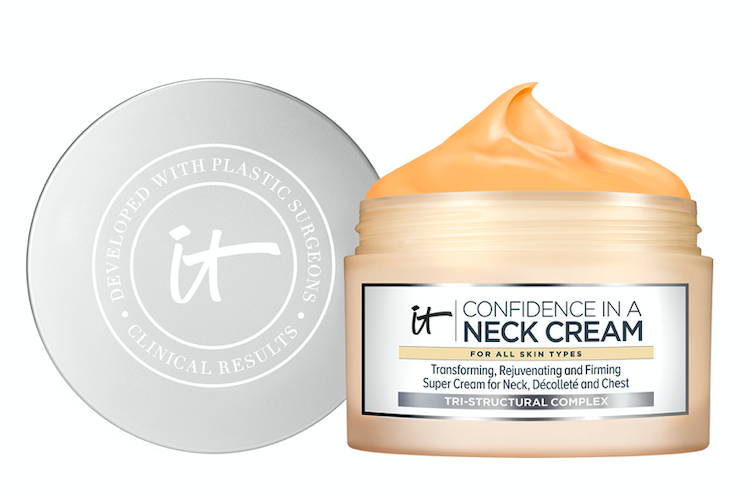 Each time I post a picture on Instagram I am apparently laying the foundation of a future turkey neck, so I loved the idea of this shapewear cream for neck and chest created by IT Cosmetics. This firming cream is created to reduce the look of the lines on your neck and improve the skin’s elasticity and hydration. With shea butter, ceramides, niacin and seaweed extract, it is the perfect ally for those of us who do business using a smartphone. Confidence In a Neck Cream ($52.00) pairs perfectly with the new IT Citrine Roller ($36.00) for a little bit of much-deserved pampering before you go to sleep. Does 3 full days of oil-free hydration sound too good to be true? Frequent flyers, rejoice: IT is a reality. 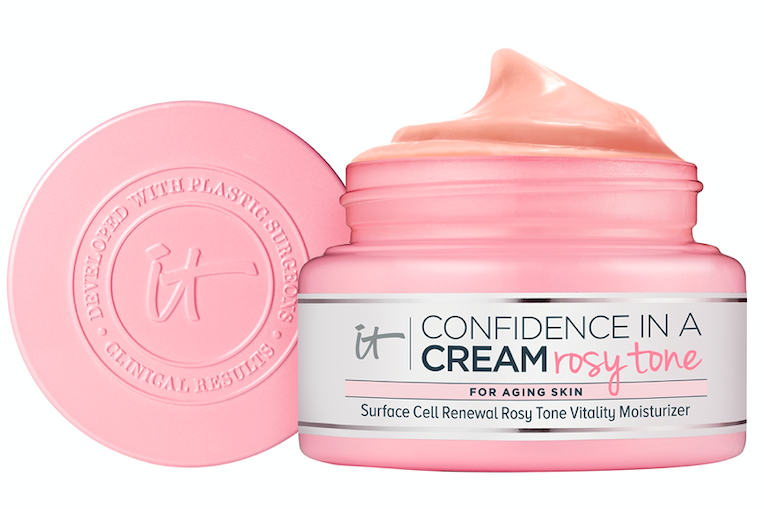 IT Cosmetics’ new moisturizer ($36.00) is a weightless gel that helps smooth the appearance of fine lines, leaving skin radiant and primed for a flawless makeup application. With skin-loving ceramides, clycerins, and cactus flower extracts, it is a plumping moisturizer that sits well with all skin types. And here’s the deal: I usually stay away from gels because they don’t do anything for me, but I actually like this formula very much. 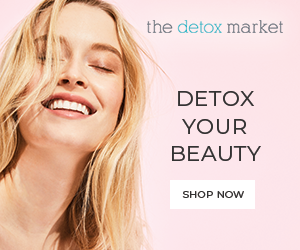 As my skin leans towards the dry and sensitive type, I was very surprised to see that it worked very well on my roughest areas and plumped out a bit my expression lines. The all-famous IT natural glow in a jar is back with a rosy hue for an instant youthful appearance ($48.00). A fantastic way to prep your skin for the sun-filled days of the Spring, it gently exfoliates dull skin and stimulates surface cell renewal. An injection of vitality and hydration, it is the perfect traveling companion to battle the flying blues. Do Women Need More Confidence? My answer is yes. Unfortunately, we live in a very visual world that expects women to look like they have had an Instagram filter for breakfast. And as much as I rebel against those expectations, it is true that I feel more relaxed in my social interactions when I am able to cover my ever-present dark circles. Why, you’ll ask? Because some times it’s all that people will notice, proven by the fact that they will interrupt whatever I’m saying to ask if I’m OK or if I have slept well. Being able to take away those distractions and own my narrative is empowering, to say the least. 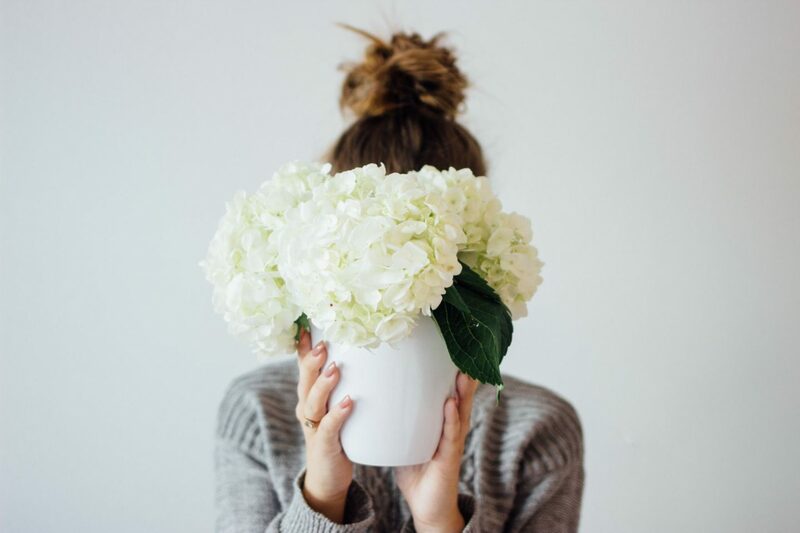 Jamie Kern-Lima, co-founder and CEO of IT Cosmetics, took a bunch of reporters and influencers completely by surprise when she admitted her own confidence struggles when launching her business. From nasty comments referring to her body shape to mansplainers in the investment world, it took all her inner strength to believe in her dreams and keep pushing for something that she knew would be an instant hit. Fast forward a few years, IT Cosmetics was purchased by L’Oreal and is currently one of the best-selling brands in the French beauty group portfolio. I am sure you also have dealt with your own confidence journey. My advice? Don’t give up just yet, you deserve all the good things that are coming your way. And, if you’d like to share your story, we’ll love to read it in our comments section.